5 frozen smoothie packs that are zero waste! 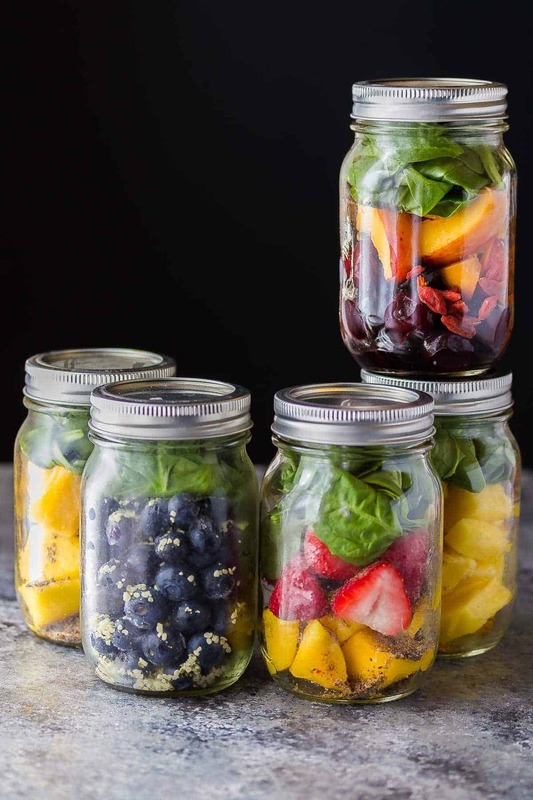 Assemble your breakfast smoothie ingredients in pint jars and you don’t need any wasteful plastic bags. Banana free and free from added sugar. 5 frozen smoothie packs are coming your way on this fine Saturday morning! Today I am sharing FOUR brand new smoothie recipes with you (and one favorite I’ve shared before)! Each and every one of these smoothies is completely sugar free. That means no juice, no maple syrup, no honey. Nada. Just the natural sweetness from the fruit in the smoothie. Another thing you should know: I’m a banana-hating lunatic! I really, really can’t stand them, and I have a really hard time finding banana-free smoothies. 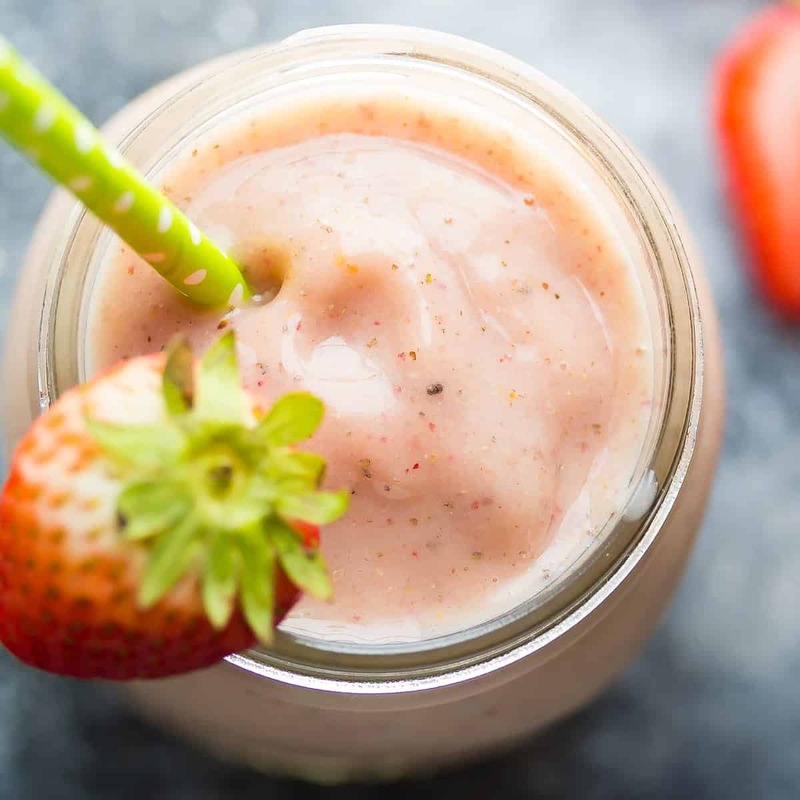 Despite the lack of bananas, these smoothies are nice and thick, which is important in keeping us full for longer according to a recent study. So today, I’m giving you the recipes for four brand-new sugar-free, banana-free, (mostly) vegan/dairy-free healthy breakfast smoothies, aaaand showing you how to make them ahead with these frozen smoothie packs. Prepping your smoothies ahead means that in the morning all we have to do is throw my prepped ingredients into the blender and add some liquids. TOTAL lifesaver for morning zombies like myself. 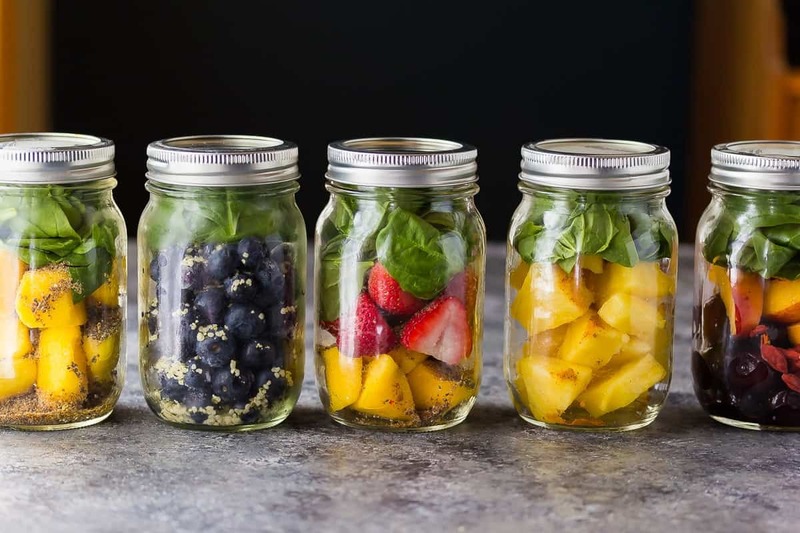 You can prepare these smoothies in freezer bags, however I prefer using jars, since they are re-usable. 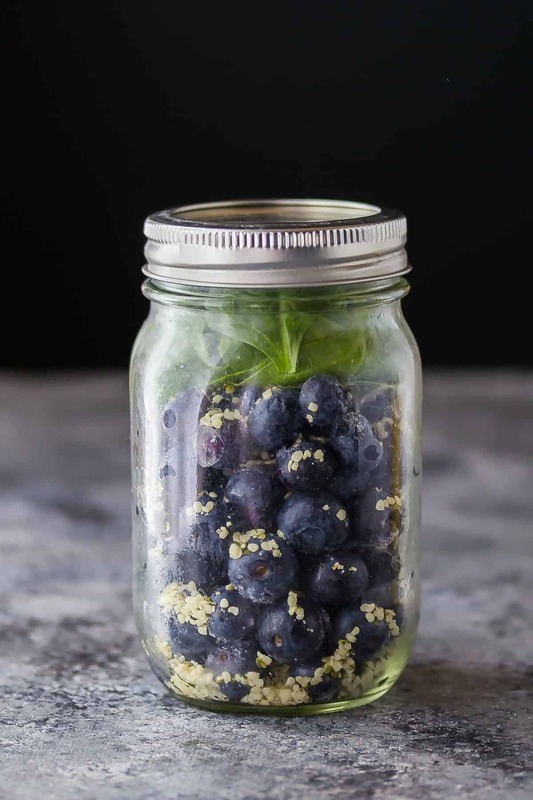 Jars require more space in your freezer to store, and acquire frost faster, so it’s best to only prepare the jars 2 or so weeks ahead of consuming them. 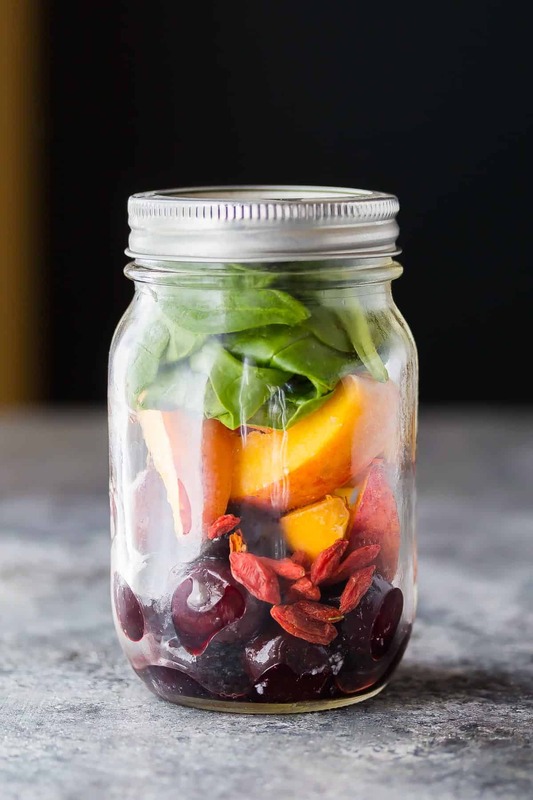 To prepare your smoothie packs or smoothie jars, place the fruit chunks at the bottom, followed by add-ins. Extracts, flax, chia seeds, spices etc are all totally fine to add in! Top the jars with any greens, then seal with the jar lids. 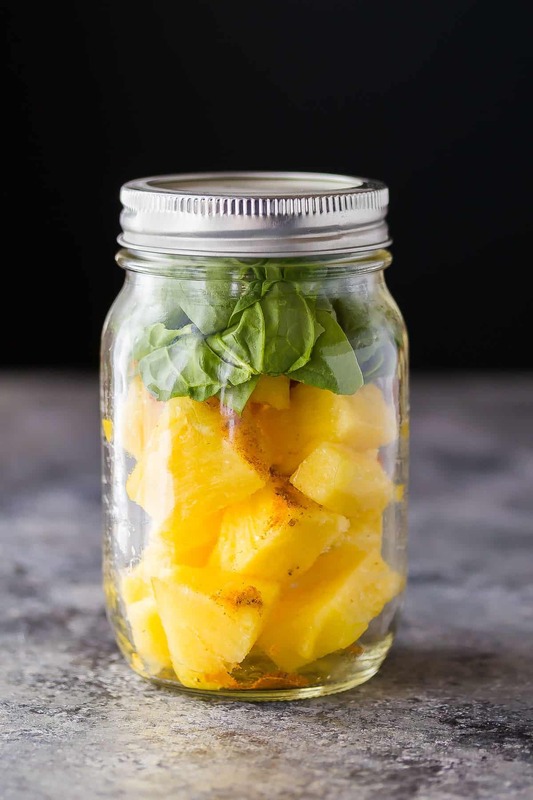 *note: make sure that the fruit you are adding to the jars is already frozen, as it may become difficult to get them out of the jars if they are added fresh or at room temperature. These smoothie jars will keep for 2 or so weeks in the freezer. To prepare your smoothie, dump all ingredients out of the jar into the blender. You may need to use a spoon to loosen out the ingredients. Add the almond milk (or coconut water as indicated) to the jar, put the lid on and give it a good shake, then dump it into the blender. This helps get anything left in the jar out. Blend away, then add the smoothie back into your jar and enjoy! 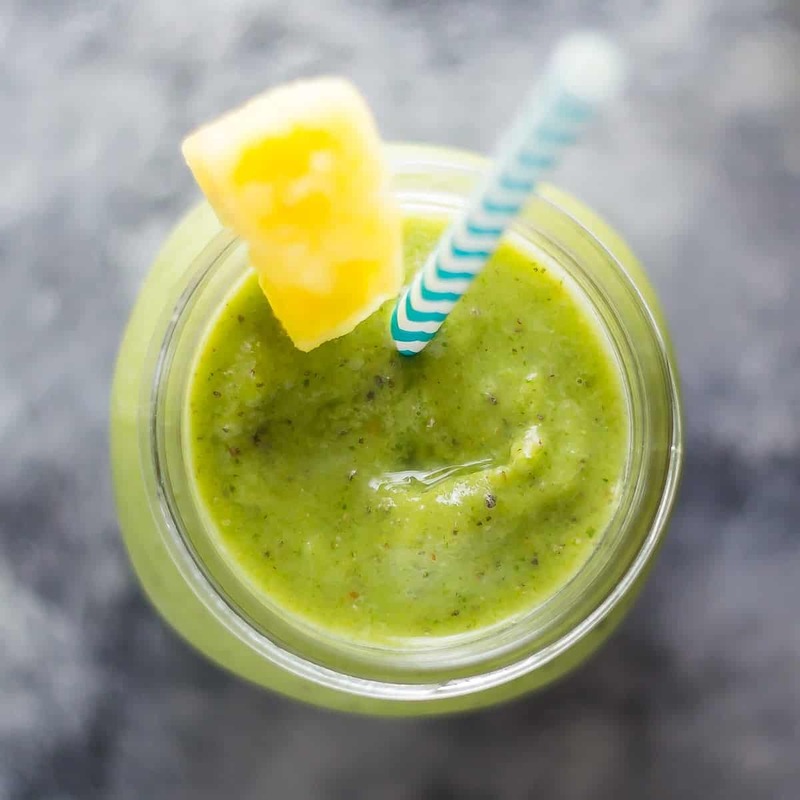 This smoothie is PACKED full of anti-inflammatory promoting ingredients including the wonder-child turmeric, pineapple and leafy green spinach (or kale). You can’t taste the turmeric or the leafy greens, just pure tropical bliss.
. The blueberries, coconut water, nutty hemp hearts and greek yogurt pair perfectly together! …so much nutrition packed into one drink! 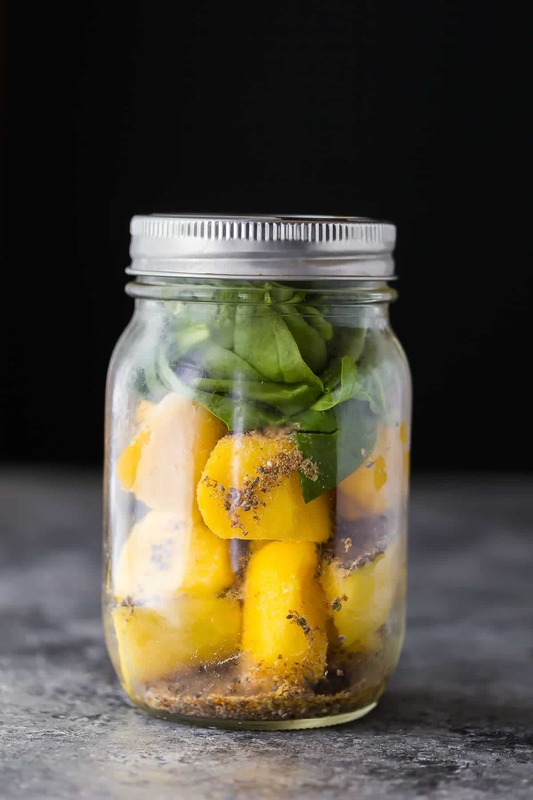 A touch of almond extract pairs surprisingly well with the mango and really takes this smoothie up a notch. are linked to a huge list of health benefits including longevity, calmness and improved sleep, and weight loss. Interestingly, cherries are a good source of melatonin and are linked to improved sleep as well. Maybe this smoothie should be re-named the Good Night Smoothie? This goji peach cherry smoothie is so surprising, in that it tastes like…chocolate! 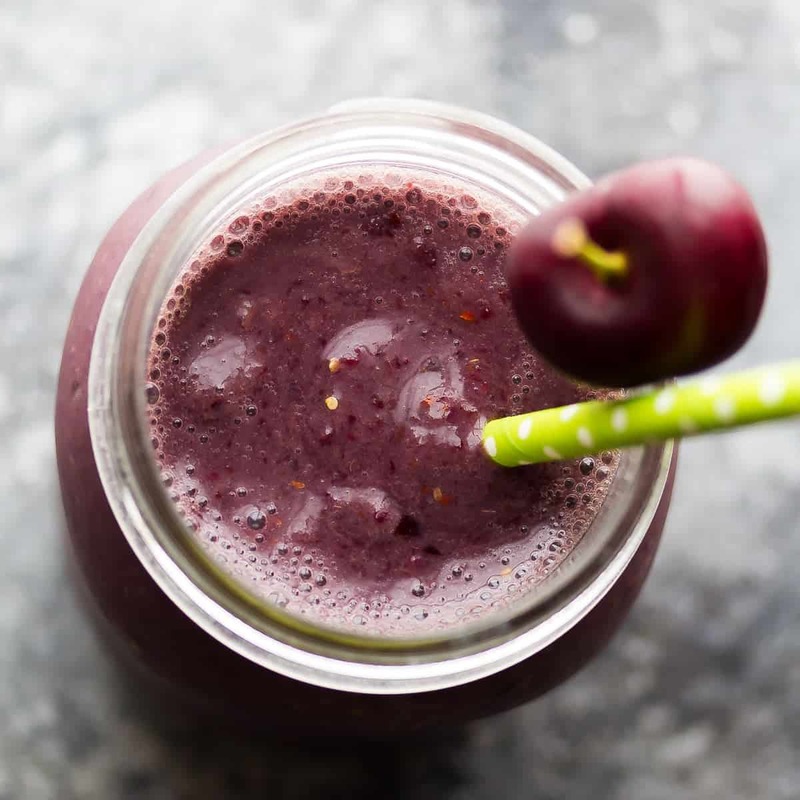 Something about the combination of cherries and goji berries really brings out chocolate flavors, though there is no trace of cocoa powder to be seen in this smoothie. Absolutely delicious. Kai’s favorite! This simple smoothie is subtly sweet, and gets depth of flavor from a touch of chai spice mix and vanilla extract. 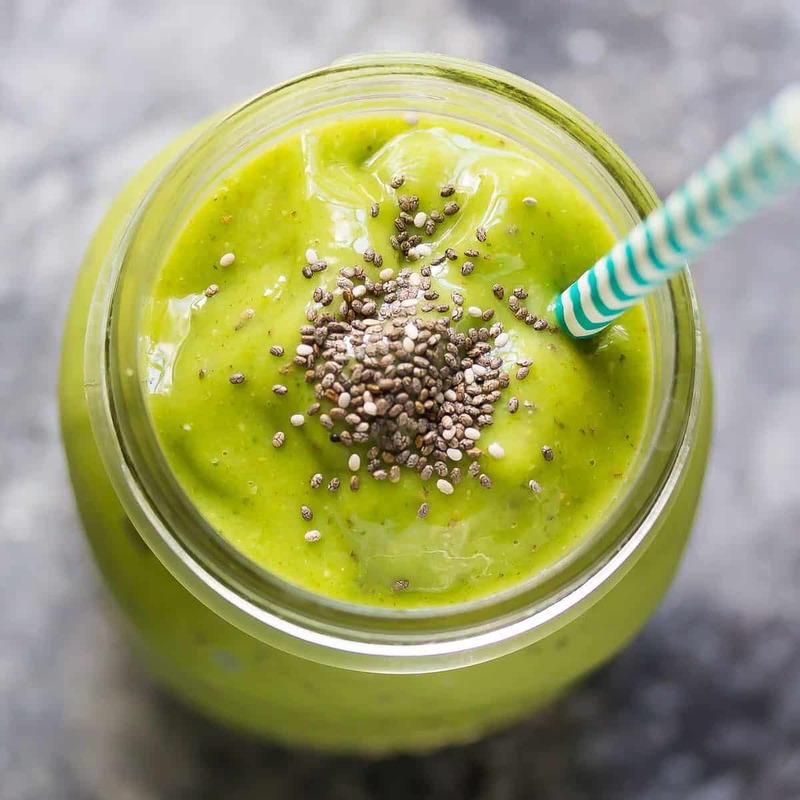 Add ground flax, chia seeds, and a handful of spinach for an even healthier smoothie! Hello there. I was wondering you have a link to print all of the smoothie recipes at once? Hi! At this time I do not, you’ll have to go to each recipe and print them out individually. How long do these smoothies stay good in the freezer for? I’m giving the meal prep thing a go. Hi Gabbie! I have left these as long as 3 months! They can look freezer-burned but I have never tasted it in the smoothie. Hope you enjoy! Hi I love the ideas of these and have started making them in the mornings. So far only tried the kale and pineapple and blueberry coconut ones. They taste great how ever I have a couple issue/questions. How do you fit these in a pint size jar ? Mine do not fit. Also the greens in both of them do not blend very well. Each smoothie has been watery and the kale chops up but still is solid and you have to kind of chew it as you drink. Not ideal. Any tips? Hi Wes! 1. do you mean the ingredients don’t fit in a pint jar or the blended smoothie doesn’t fit? I normally drink it down a bit then add the rest of the smoothie and wash the blender. The ingredients for sure fit in a 1 pint jar! 2. The smoothies should definitely not be watery, and bleck that sounds gross to have to chew the kale! I blend mine until I can’t see any chunks. You may have to blend for a minute or two, depending on your blender. I’ve done this in a really basic blender and had no issues with chunks, so I would try blending for a lot longer. I really hope this helps! Think it depends on the blender. I previously had a Ninja and it left chunks of spinach. I have a Vitamix now and it blends so smoothly. Loved finding your recipes. I do like bananas but I’m diabetic so smoothies that are banana free are a much better option for me. Thanks for sharing these. I’m so glad these recipes are usefull to you, Deb! I hate using freezer bags but I put the smoothie mix in the freezer bag, empty it in the mixer, and then place it back in the freezer until I fill it again with smoothie material. That way, I only use 7 bags over an dover since they do not get wreck and I don’t need to wash them in between use since I am filling them back with the same thing. Yay! Love meeting fellow banana-haters 😉 Hope you enjoy them, Anna! I just signed up and I already love your recipes. I just have one question. I understand that you use 1 pint jars. 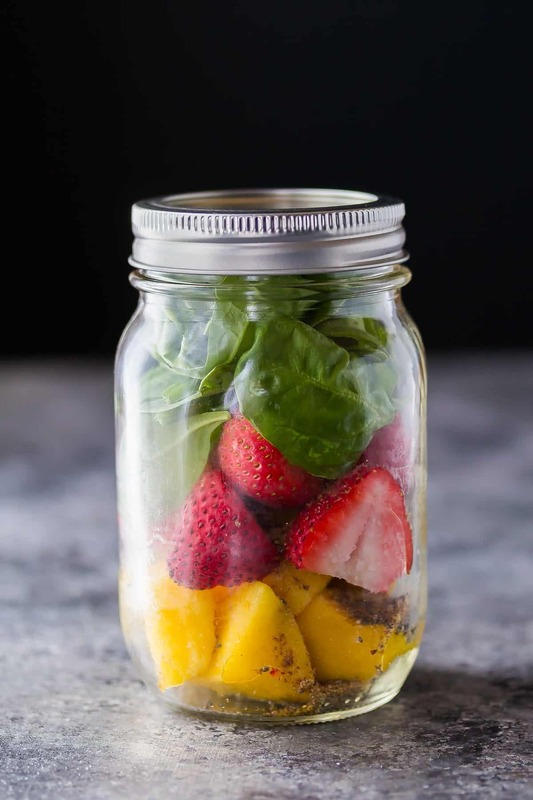 If you fill them up with fruits/vegetables, like in the pictures, how does the smoothie fits back to the same jar after blending them; given that the liquid will be added. Please reply. Hi Narinder! That’s a good point, they do end up being slightly larger in volume than the jar. I drink mine down a bit, then add the rest of the smoothie before cleaning out my blender. Okay, I see it says mostly dairy-free. My bad. ??? I was excited to read these were vegan recipes…until I read the ingredients for the blueberry one, which includes yougurt. What??? Hi Denise, I love this idea but I’m sceptical about the ingredients coming out of the jar easily after being in the freezer. And how do the greens react to being in the freezer? Are they as good as fresh? If I wanted to add protein powder what order should it be in ? I.e. Top, bottom, middle? I’m a morning zombie too! Hi Heidi! I was skeptical too, but everything really shakes right out, and if there’s anything stuck in the jar, you just add a bit of almond milk and give it a good shake up. The greens are fine, you wouldn’t want to eat them in a salad, but you won’t notice a bit after blending. I don’t use protein powder so I’m not sure but probably near the top. But if any sticks to the jar, just add some almond milk and shake. What size jars do you use in these recipes? 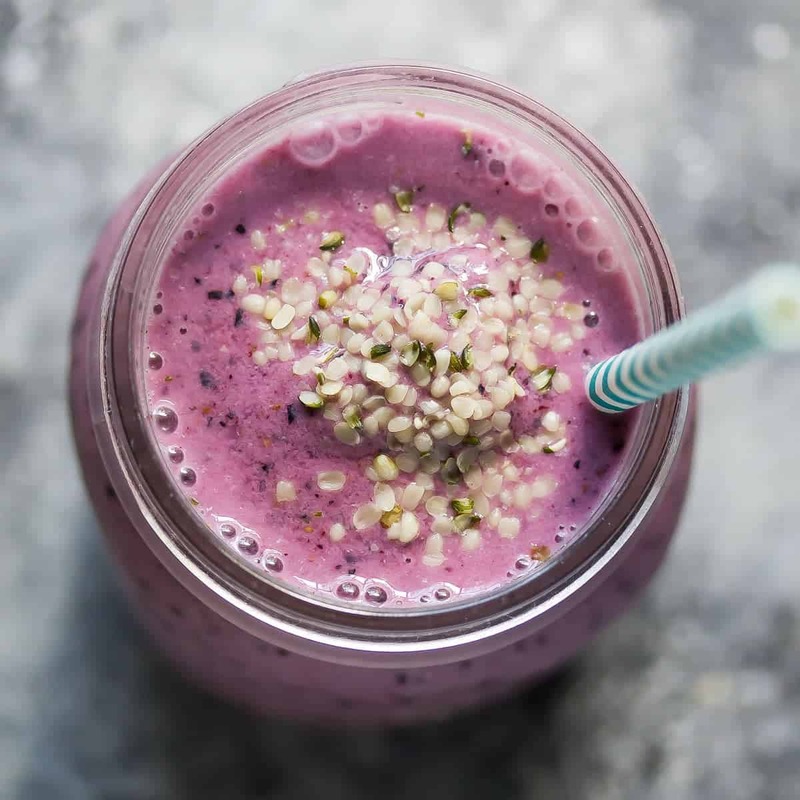 Is there any alternative to the hemp hearts? The hubby and I are active duty military and this ingredient can cause false positive testing in urine drug screen for THC. Hi Hannah, you could sub chia seeds, or a tablespoon of ground flax? They will give a boost of protein as well 🙂 I hope you like the smoothies! I am wanting to start to drink a smoothie every morning. I need to freeze mine in freezer bags. How do I do that? Is it different. I will label them, and put down what liquid and ? Whatever else it will need. Thanks Denise. Hi Denise! You can certainly freeze the ingredients in bags as well, exactly as outlined for jars. Could you just leave them in the jar, add liquid & attach it to the blender instead of dirtying the blender? Hi Marjory! I’ve never tried that, it doesn’t work with my blender. I guess if you have a magic bullet or some other blender that you can attach a jar to, it would be worth a try? I’m glad these smoothies are useful for you, Lu! 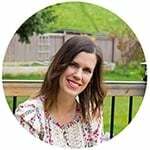 I drink a smoothie nearly EVERY morning for breakfast so I’m loving all these fun and SUPER easy smoothie twists, Denise! Love love LOVE that I can keep all the ingredients in mason jars and then blend ’em up whenever! I am going to have to try your turmeric pineapple smoothie. I take turmeric capsules every day to help with back pain and am always looking for ways to add it to recipes.